Cassia Leptophylla-Native to Brazil, the cassias are showy flowering trees that brighten landscapes in the warmest climates—not just with yellow blooms but also with pink, cerise, and white ones. 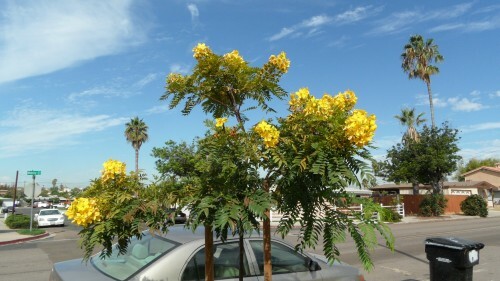 Open-headed, fast-growing, nearly evergreen tree to 20–25 ft. tall, 3 ft. wide; low spreading with tendency to weep. Very shapely and graceful when pruned to single trunk (otherwise, becomes sprawling). Deep yellow flowers to 3 in. wide come in 6 to 8-in.-long spikes; main bloom appears in summer; sporadic bloom comes later. Flowering dates are approximate, since plants may bloom at any time or bloom intermittently over a long period. Plant in soil that is well drained. Prune plants when young (to develop a strong framework) and as needed after flowering. They need little to moderate water.